Had the opportunity to spend Sunday, May 18, 2014, on a marker trip, this time in search of Wisconsin Historical Society Maritime Trails markers, most of which commemorate historic shipwreck sites. I had 10 markers on my list. A couple I couldn't locate, I couple I decided to save for another trip. Even so, I came home with 24 new posts for the website! I was on the road about 10 hours. We travelled nearly 200 miles round trip from Green Bay -- first through Sturgeon Bay and then north on Highway 57 to Valmy, Jacksonport, Baileys Harbor, and then on to Ephraim; then south on Highway 42 through Fish Creek. In Egg Harbor we took the turnoff to County Road G / Horseshoe Bay Road, then County Road B / Bay Shore Drive -- where it was just me and a Harley rider all the way to West Carlsview Road. While meandering through the county road open spaces, I noticed a huge red-tailed hawk circling just overhead, and pulled over to take some photos. He circled out of range, so I followed him for a bit. Suddenly, a rustling from the woods to my left, and out bounded a frightened buck, who made a b-line across the road in front of me. A few seconds of silence, and then more rustling. This time a doe and her fawn so close they nearly brushed the hood of my vehicle as they sped past. I looked back up for the hawk. He had turned his course towards the bay, and soon disappeared behind the treetops. This marker trip took me into three of Wisconsin's State Parks -- Potawatomi State Park, Whitefish Dunes State Park, and Peninsula State Park. These places are so beautiful, I don't really have words to describe them. Even my photos don't do them justice. I also discovered Bailys Harbor Lower Rangelight has been restored, with flashy red accents! It looks smashing! Also had the chance to finally visit Eagle Bluff Lighthouse at its pristine location inside Peninsula State Park. Another discovery -- a series of markers placed by Door County Coastal Byway. 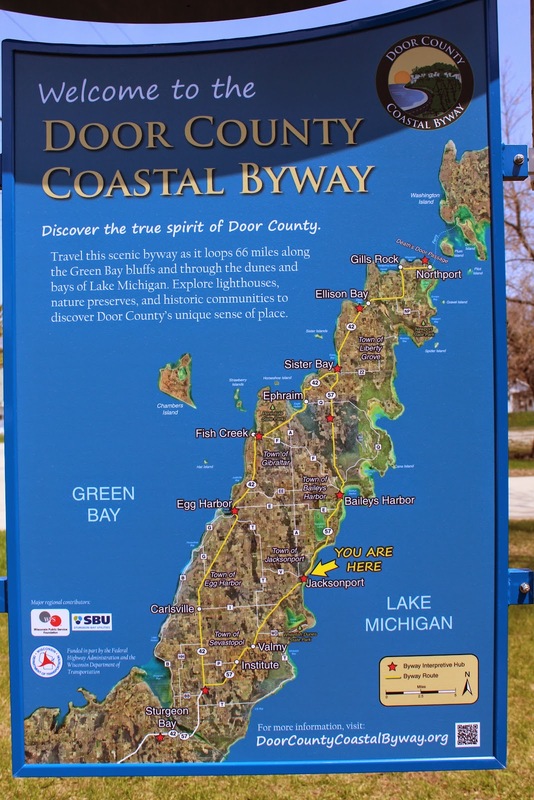 These fabulous markers are designed to introduce visitors to the coastal towns and villages of Door County. The two I located included a list of the community's natural and historic sites. Very cool! In total, I've added 24 markers to the website. Check them out below. 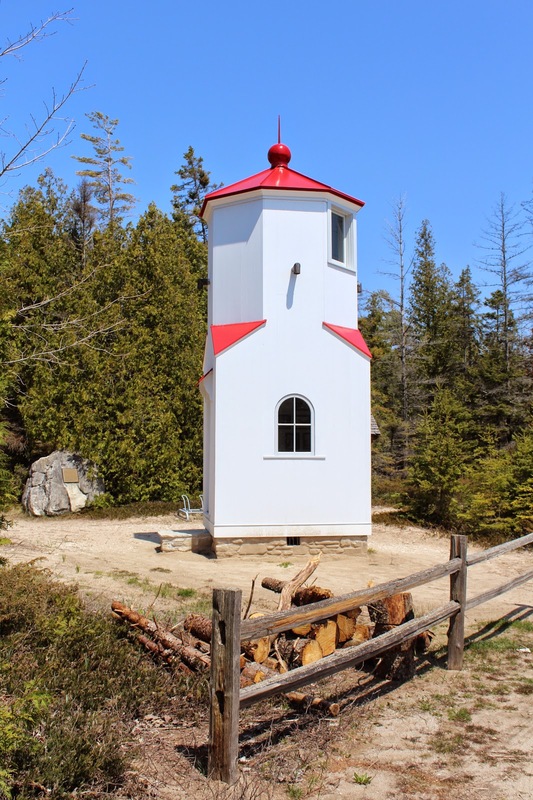 Click here to view all Door County Markers / Sites visited to date. Enjoy the photos, and thanks for stopping by! these photos were taken May 18th, and still no leaves on the trees!